Character sheets now available for download. Read the most recent updates on XENOMORPH here. It is the perfect killing machine, survivor of a thousand bloody battles. It is the ultimate hunter, evolving, adapting, taking the very form of its victims. It is a monster with an insatiable appetite, existing only to devour and breed. It is the Corporation. Far out on the Rim, aboard the csiro-billington research station Shackleton, a boarding team assembles for an urgent mission. Some are corporate security – drop bears – others are science techs. They are to intercept a Colonial Marines military vessel that has appeared out of hyperspace, seemingly disabled and abandoned. The name of the ship is Sulaco. Systemless roleplaying for five corporation pawns in the weeks immediately following the events of the movie Aliens. This is not a bug hunt. This is a love story. This one could really hurt. Presented by John and Philippa Hughes. Phenomenon 2012, Canberra, Queens Birthday Long Weekend. The long: Systemless roleplay theatre. No dice. Simple hand signing (Martian seduction and Venusian aikido) for negotiating inter-character aggression and intimacy. Loud budda-budda vocalisations for the firefights. BYO screams. 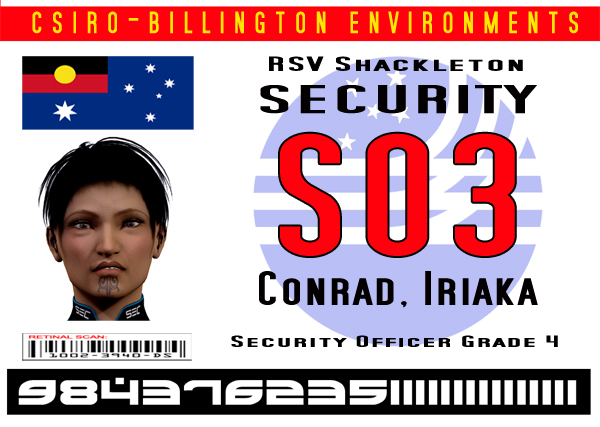 Iriaka Conrad (female, mid thirties). Drop bear and Shackleton security officer. Usually a consummate professional, of late Conrad has become increasingly unstable, angry, and violent. Chul-Moo Crowe (male, forty-ish). Drop bear and Shackleton security officer. An aggressive bully all-too-familiar with violence, Crowe has been demoted for going too far. Cai Gentle (female, mid twenties). Shackleton shuttle pilot. Quietly assertive and ethical, Cai has always lived on-station. The Corporation is all that she has ever known. 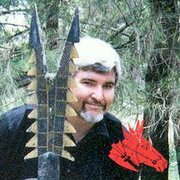 Wayne Gould (male, late-forties). Head of Shackleton security, a drop bear. Gould is a warrior past his prime, weighed down by what he has done in the name of the Corporation. Uki Pynne (male, mid twenties). Biotechician and systems professional, Pynne is a genius, and he expects everyone to recognise his gift. His fascination is life on the planet below. Please read these background briefings before play begins. None of the handouts contain spoilers, all are safe for pre-game perusal. 2. Xenomorph Background Briefing (7 page PDF). Shackleton station, recent events, and the slow war. 3. Mission Personnel Briefing (8 page PDF). Character portraits and general background to help you choose characters for play. Full character sheets are now available for download as PDFs (print or tablet). Booked complete teams are encouraged to allocate and read characters before the convention, so as to maximise playing time. 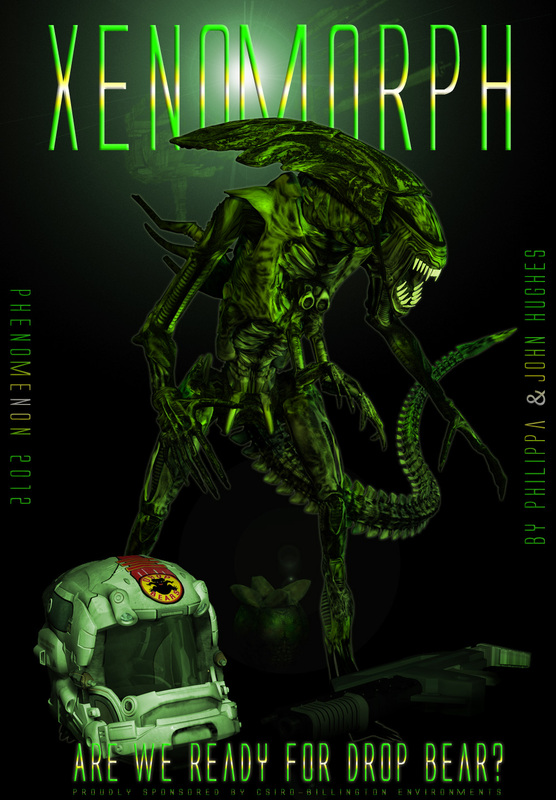 Xenomorph is our take on an rgp reboot of Alien3, the deeply confused successor to the classic science fiction movies Alien and Aliens. Alien: Aliens: Alien3: Alien Resurrection represent mother lodes for science fiction cinema and roleplaying. However, after two classic films, the Alien3 movie went through production hell, with multiple scripts (including an early one by cyberpunk novelist William Gibson), changes of director and direction, and massive interference from Fox Studio. The result was a mess. We love the entire quadrilogy (though lets not talk about AvP), we respect Ripley, and we’re not going to kill off Hicks and Newt in the first thirty seconds as Alien3 did. Our reboot takes the William Gibson draft as one of our inspirations, though of course an RPG game has to be very different to a movie script, and we have a few ideas of our own. This will be SF with a distinctly antipodean flavour and cast. (How to employ the original characters proved a challenge: they will be kept off-stage. They simply burn too bright.) We don’t want to simply rehash Aliens – fun as that would be. We want to take the story somewhere different. The Alien Quadrilogy exhibits a high degree of self-awareness, typified by the Ripley quote above. We think the challenge plays to our design strengths: an atmosphere of constant, gritty fear and tension; character insight and development; and big questions writ large in smoke and laser light: a chance to ask and play out a series of ideas about gender, embodiment, moral courage, and love. All with big guns and shadows in the dark. Shadows that will kill you. Or worse. Pip and I will be posting on the module’s development over the next few months, and posting character summaries and game background. For now, we’re watching the movies and reading Dark Horse comics, the Colonial Marines Technical Manual, and some interesting critical books and essays from cultural and film studies. One particular inspiration is Stephen Mulhall’s On Film: Thinking in Action, which explores how the quadrilogy grapples with a host of questions surrounding human purpose and identity in a practical and active way. Questions mean conflict. Conflict makes for great roleplaying. Are we ready for drop bear? Proudly sponsored by csiro-billington environments, greening the galaxy since 2089. Aliens (TM) and (C) Copyright 1986 Twentieth Century Fox film corporation. All rights reserved. The Alien series is created by Dan O’Bannon and Ronald Shusse. Alien design created by H.R. Giger.